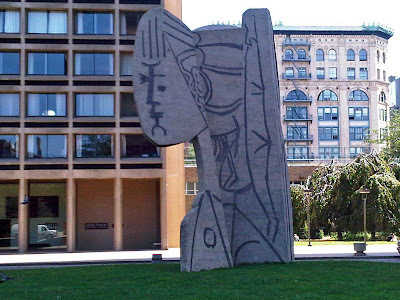 I'm no great Picasso fan, but I'm glad his threatened curtain at the Seagram Building got a reprieve. Here [in 21st century New York], art is never spoken of in moral terms, and most aspects of everyday life--food and drink and bathroom fixtures--are mostly spoken of in aesthetic terms. I have not been a great fan of Picasso. Maybe it's just my contrarian streak reacting to his conventional status as the preeminent painter of the past century. Maybe it's my overexposure to his "Bust of Sylvette", in an enlarged version executed by the Norwegian sculptor Carl Nesjär, that eyed me balefully (see photo above) on my regular Sunday transits of the Silver Towers courtyard going to and from brunch at the Prince Street Bar in SoHo when I was living in Greenwich Village. Mostly, though, it's that I never did get cubism. I can appreciate painters like Mondrian or Pollock (to name two whose styles seem, to me, as different as conceivable), who went the non-representational* whole hog, or like Bonnard who, while taking some liberties with perspective, scale, and other "naturalistic" qualities, produced images that were recognizable as real world objects. Cubism, which purported to portray objects from several perspectives simultaneously, seemed to me an uninformative and unnecessary, even annoying, exercise. I used to feel defensive about this, thinking that my failure to appreciate what Jed Perl, an art critic whose writing I enjoy and whose views I respect, calls an "epochal shattering of Renaissance space"** might be a symptom of some deficiency in my aesthetic sensibilities. Then I found an ally in my wife, whose art background is considerably more extensive than mine. We were touring the Portland [Maine] Museum of Art and, as I started to move into another gallery, she--not knowing of my opinion--said, "Don't bother; it's all Picasso." Perhaps then my view, though at odds with that prevailing, could be justified on grounds less shaky than de gustibus non est disputandum. “Le Tricorne,” which translates to “the three-cornered hat,” was painted over three weeks in 1919, in a studio in Covent Garden, in London. It was commissioned by Serge Diaghilev, the impresario of the Ballets Russes, a traveling company based in Paris. 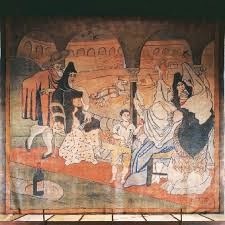 The Russian scene painter Vladimir Polunin, who helped paint the curtain, wrote that Picasso wore slippers so he could stand on the canvas as he worked. His tools, according to the critic Sacheverell Sitwell, who visited the studio, included a toothbrush. The Times piece also notes that what hangs at the Four Seasons is not the complete work. When Diaghilev needed to raise money, he had the center section cut out and sold, although the remaining two sections appear to have been joined seamlessly. So, we have a Picasso that was made as a stage prop, in collaboration with another artist, in a style other than the one for which Picasso is best known, and which is incomplete. Terry Teachout, in his Wall Street Journal piece, reports that Aby Rosen, head of RFR Holding, the company that last year acquired full ownership the Seagram Building, was heard to describe Le Tricorne as a "schmatte" (rag). If the curtain is removed, it would be an act of destruction to Philip Johnson’s conception of the Four Seasons. “Le Tricorne” is, after all, a de facto part of the architecture, and so it would constitute a major alteration to one of the city’s most admired landmarks. It might also seriously damage the curtain itself, according to conservators hired by the Landmarks Conservancy. Even with the care the conservancy has given to the curtain, it is painted on fabric that is 95 years old, and it is brittle. The conservators say that the best way to protect it is to leave it alone. Despite being "a de facto part of the architecture," Le Tricorne could not be included in the Seagram Building's landmark designation because, for purposes of such designation, it isn't considered part of the architecture. Nevertheless, its removal, and possible replacement with something else, would change the landmarked building in a recognizable way. The Picasso can be seen from outside the restaurant; in Goldberger's words, "it is part of the experience of anyone entering the building." Nevertheless, I think there are valid arguments, other than my preference, for keeping Le Tricorne in place. One compelling reason is the possibility of irreparable damage to the curtain if it is removed. In Daniel Slotnick's Times story about the court order not to remove the Picasso pending further proceedings on March 11, a lawyer for RFR is quoted as making the incredibly crass statement, "If we break it, we buy it." Moreover, I agree with Goldberger's argument that, despite the technicalities of the landmarks law, the curtain really is part of the architecture that should be protected. I'm not one of those who reflexively opposes change, and I believe there have been instances in which landmarks requirements have been applied in ways that are unnecessarily oppressive to property owners; usually, I think, because of the fear--which I consider in most instances to be excessive--of setting a bad precedent. Nevertheless, I'm troubled by what I see as a lionization of change for change's sake, and of "change agents," in contemporary culture. Yes, sometimes change is necessary. Organizations become sclerotic and need to be shaken up. Providing affordable housing without generating sprawl may necessitate construction of more high rise buildings. But unless occasioned by emergency, including by a manifest injustice, change should be considered carefully before it is implemented. It almost always has downsides as well as upsides, and it may have unintended consequences. In this respect, I suppose, I'm something of a Burkean. If Le Tricorne goes, it will be the second loss by New York City of something by a major figure in twentieth century art within a year's time. I hope it doesn't happen. *I prefer "non-representational" to the more frequently used "abstract." All visual art, including photography, "photo-realist" painting, and sculpture is, of necessity, abstract. **Perl, Jed, "The Abstract Imperfect", The New Republic. November 3, 2011 ( a review of De Kooning: a Retrospectve at the Museum of Modern Art). ***For an account of my naive groping toward a standard of aesthetic judgment, see this post. India Pale Lager? I've long been a fan of India pale ales, or IPAs as they're usually called. I like their intense hop bitterness balanced, in the best of them, by a rich barley malt flavor. I didn't know quite what to expect from this lager offering by Coney Island Brewing Company. 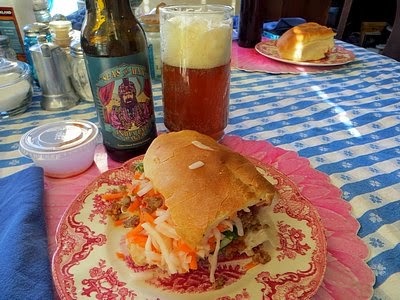 "India Pale" made me expect big flavor, so I paired it with a Vietnamese bánh mì from Hanco's, doused with some extra hot sauce. I poured, and was rewarded with a full, foamy head. The color (photo above) was a golden amber. I took a whiff: the aroma was powerfully hoppy, with some floral notes. My first sip made my taste buds confirm the evidence of my nose. The hops have it! A few bites of the sandwich convinced me it was a good pairing. Still, I thought, while this beer goes well with spicy, flavorful food, is it something I'd want to drink by itself? After a few minutes, though, the beer started to open up. I began to get some of the "[b]ig citrus and passion fruit aromas" promised on the label and on the brewer's website. The flavor also became more rounded, with fruit overtones softening the hoppy edge. I realized that I should have taken the beer out of the fridge and poured it a few minutes before tasting. I checked the ingredients on the website. Five kinds of hops are used: Galena, Warrior, and Simcoe, all of which are considered "bittering" hops; Cascade, which is moderately bitter and gives a floral aroma; and Citra, a fairly new variety that has quickly become popular (with some dissenters) and that accounts for the notes of passion fruit. There are four malts: two row barley (commonly used in the best beers and ales), malted wheat, oats, and biscuit malt (I had to look that up). The last three would, I believe, tone down the flavor of the two row barley, and, set against the assertiveness of the hops, explains the beer's lack of any noticeable malt flavor or aroma. On balance, this is a good beer. It would go very well with spicy food like bánh mì, Hunan or Szechuan cuisine, and the more picante of Mexican dishes. At a moderate 4.8 percent alcohol by volume, it shouldn't get you in trouble too quickly. My preference continues to be for IPAs that balance the hops with malt. Still, I would drink this again, maybe with my next takeout vindaloo curry. So, what about this Coney Island Brewing Company? Is the beer made on Coney Island? No, it's brewed upstate, in Clifton Park, just south of Saratoga Springs. Coney Island Brewing is owned by Alchemy & Science, a "craft beer incubator" that is , in turn, owned by Boston Brewing Company, makers of the Sam Adams line of brews. Next on my beer tasting agenda is Coney Island Brewing's Mermaid Pilsner. I'll be reporting on it soon. Note: I've updated the post to reflect the fact that Coney Island Brewing is now owned by Alchemy & Science.